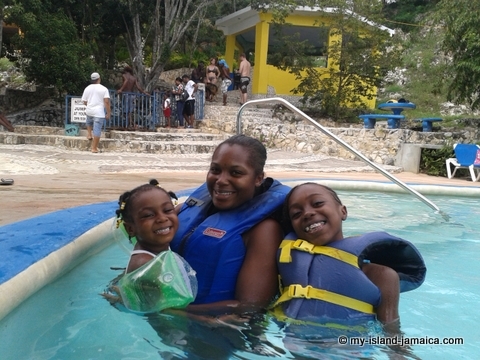 Best Attractions In Negril Jamaica? Here's Blue Hole Mineral Spring! 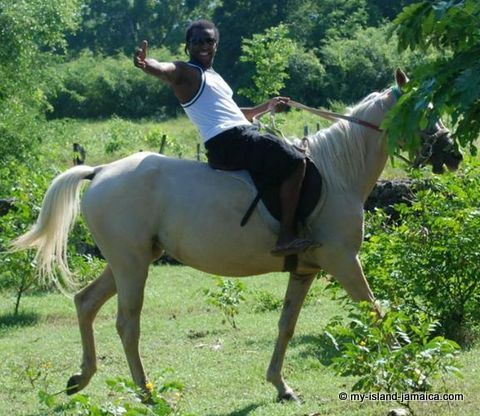 So you know of Negril as the capital of casual in Jamaica right? 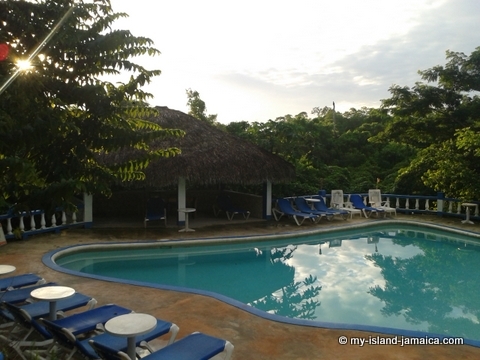 Well Negril offers even more now! In addition to the The Cliffs At West End, The Booby Cay, The Lighthouse, The Kool Runnings WaterPark, the Hummingbird Garden, The Royal Palm Reserve, and of course, the pristine white sands of Seven Miles Beach, Negril now boasts the alluring Blue Hole Mineral Spring & Hotel! 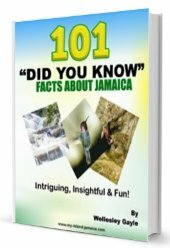 Blue Hole Mineral Spring sits beneath a cavernous opening in Jamaica’s terrain and is completely encased by Karst limestone. The naturally occurring minerals in the limestone act as an underground filter for the steady upwelling of water, leaving behind a luxuriously pure bath of minerals for guests to enjoy! And to those like me who are not brave enough to jump into the 40+ feet deep cavern, the playful and inviting mineral pool is there for their enjoyment. Where Is Blue Hole Mineral Spring? Looking To Visit Blue Hole? Click Here To Contact Them Right Now! 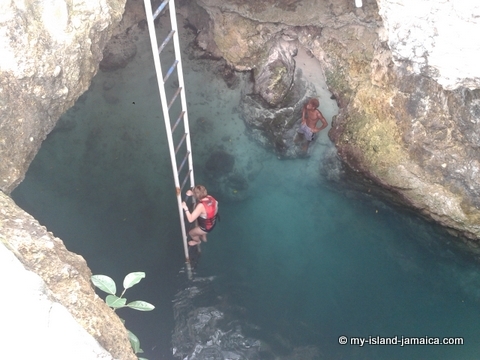 Blue Hole Mineral Spring is actually located in an a small, friendly and crime-free community named Brighton, just 20 minutes south-east of Negril. 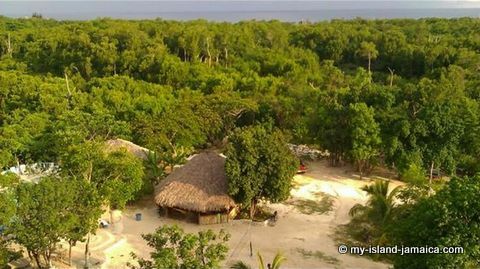 The story of Blue Hole is a fascinating one; The property was wild, unsued land until Wabba, it's proprietor, met it's now owner, Matt (a US national) at a small villa in Little Bay. Wabba was then the driver and tourguide. Wabba took Matt hiking, showed him this untouched property and the rest, they say, is history! 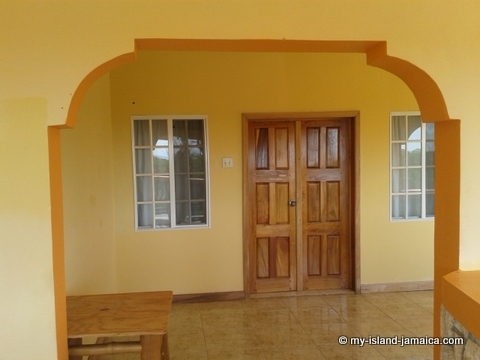 They partnered, bought the property, and started to beautify the area. Guests started trickling almost instantly and by 2009, most of its current amenities were installed, including the beautiful mineral pool which provides an option to those who prefer not to venture the deep and captivating Blue Hole. Nestled in the secluded (and a once jungle area) of Brighton, Blue Hole offers its visitors a most rejuvenating experience! Outside of the fact that there is absolutely no harassment here, Blue Hole provides the ideal experience to those looking for a break from the hustle and bustle and take some time to find self. It's all nature; its beautiful flora and fauna only adds to its peace and tranquility. 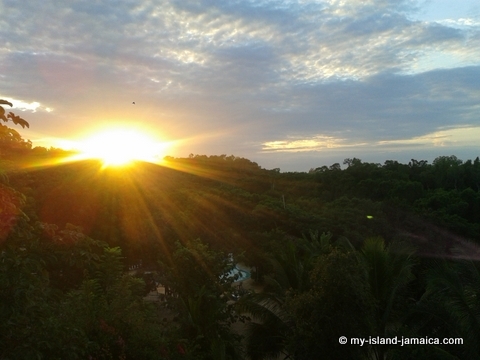 The sunrise, for example (picture above) was breathtaking! I was also particularly fond of the usually wild ball plates birds that came just a few feet away from us to fetch berries. And of course, the mineral spring and pool are already known for their invigorating and revitalizing properties. Despite the fact that Blue Hole is popular for its rejuvenating and revitalizing properties, there is still a lot in store for those looking for fun and activity. 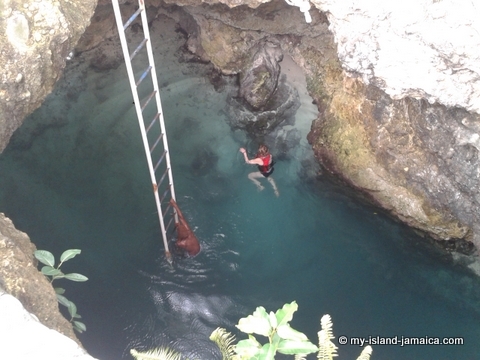 Join with the resident divers and jump and play in the Blue Hole. Swim or paddle in the mineral pool. 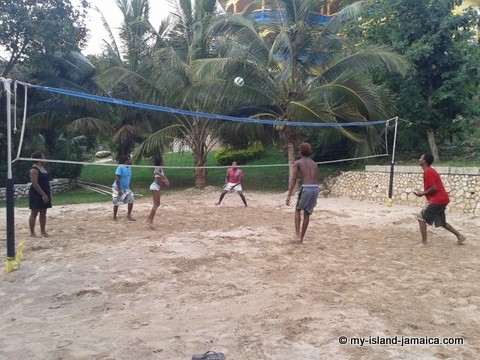 Enjoy a game of volleyball on the sand court. Hang with other guests in the bar, enjoy a few games of dominoes over a few drinks. And by the way, I almost forgot, they do have the perfect settings for a Jamaican wedding. There is a spacious and an appropriately equipped & decorated hall area as well as the beautiful pool deck; whichever you prefer. 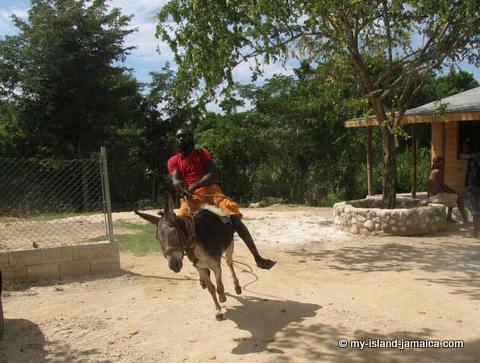 Ever heard of the annual Negril donkey races? Well it happens right here at Blue Hole! Every January/February. The event was pioneered by Wabba's uncle, but now a signature event in Blue Hole's annual calendar. They also host a hugely popular New Year's party that is free and open to all community residents and their guests. 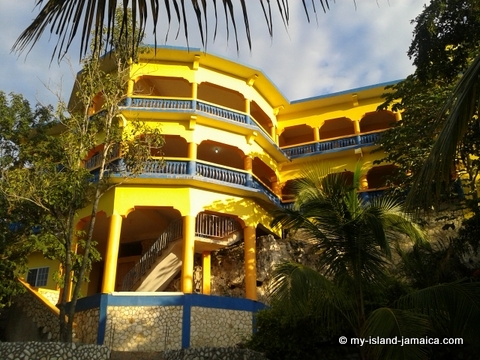 In all honestly, I tend to find that I get the best Jamaica food at these off-the-beaten path eateries and attractions, and it is no different here at Blue Hole Mineral Spring & Hotel. In fact, it was apparently the open air, wood-fire cooked, Jamaican fried chicken that impressed Dave and his wife the most. Dave and Susan, both Newfoundland Canadian residents, visited with a group a few years ago and now, not only are they frequent and esteemed visitors to Blue Hole, they are their biggest independent marketing agents! Dinner was garlic lobster - delicious! They offer some of the most authentic Jamaican food! 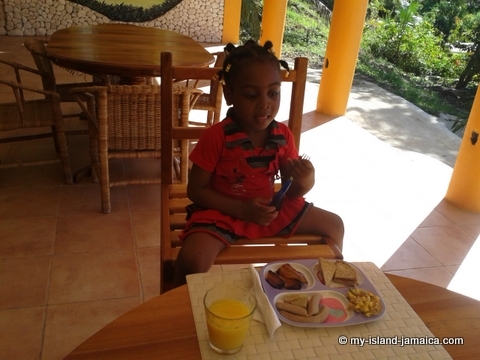 Below is Ali, my baby, getting ready for breakfast - ackee & saltfish, boiled bananas and fried plantains! Started with the objective of expanding their product offering and capitalizing on the popularity of the attraction, The Blue Hole Hotel was envisioned. Work was completed in 2013 it is now officially open! It boasts ten (10 ) beautiful deluxe rooms that includes all the standard amenities. We had the kids during our one day stay and so took one of the bigger rooms comprising two beds! 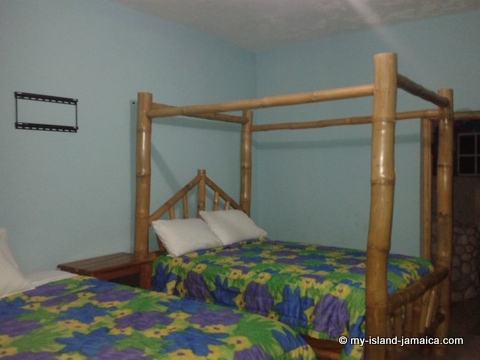 I loved the creative use of the Jamaican bamboo! But despite their increasing popularity and profitability, Matt, Dave and Wabba have even bigger objectives for this lovely property. All in all, we absolutely loved the experience and can't wait to return for the Donkey races in the new year. Thanks again Blue Hole for making our thanksgiving retreat memorable! 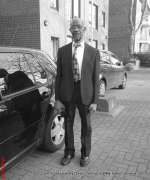 Note: The host of the slideshow has removed the embed link capability. Please click this link to view it externally on their website.